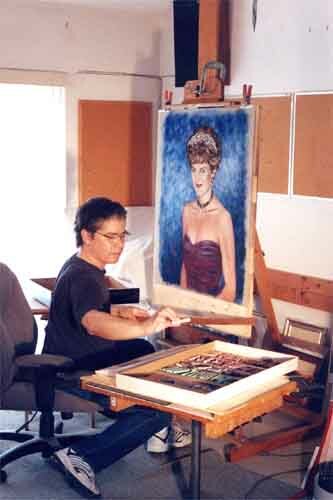 As a child, Brian Owens began his artistic journey with a pencil and paper. Creative drawing was his form of entertainment. Later in life, Owens learned the traditional academic methods of how to draw what you see. "Draftsmanship" as it is called, is the foundation for pastels which is an extention of drawing. "I prefer to keep a pastel composition as simple as I can and leave some areas of the paper untouched. Pastels have a unique appearance becuase the medium is unique ... generally more reflective than paint ... the colors, more intense". Pastel is a popular traditional medium that has been in use for hundreds of years. A pastel "drawing" or "painting" is simply called a "pastel". 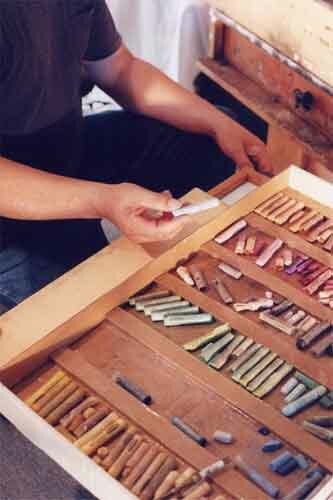 Pastels have a unique appearance because the medium is unique. Pastels are generally more reflective than paints and the colors often appear to be more intense. Pastel is similar to chaulk. It is sold in sticks of various colors. The sticks are rubbed onto special types of paper or board that also come in various colors. Usually, a finished pastel resembles a drawing more than a painting because of the way most artists use it; They hold the stick with their fingers and they draw with it. The word pastel makes me think of the exquisite work of Edgar Degas; A late nineteenth century artist who worked in many mediums and painted ballet dancers in his own sketchy style. Like other mediums, pastel is as versatile and flexible as the artist using it. It is used for various subject matter; landscapes, figures and portraits of course. Given enough skill and time, it is possible to work on a pastel until it looks more like a painting than a drawing. A pastel that is "pushed" far enough may be called a "pastel painting". Daniel Greene, one of America's pre-eminent pastelists, is a perfect example of this. Greene is so fluent in his use of the medium that much of his work easily exceeds the definition of "drawings". I have done a few myself, but nowadays I prefer to stop short and develop looser, simpler compositions. The primary difference between pastel and paint is that pastel does not "dry" like paint does. A stick of pastel is dry to begin with. However, a pastel drawing/painting will probably smear if you rub your finger on it. Consequently, it must be framed and protected by a sheet of glass or plastic when it is displayed. When I draw a pastel I am careful not to add more pastel than the tooth of the paper can hold. Before I deliver a pastel, I turn it upside-down and "flick" the paper a few times so that any loose pastel particles drop off. Then I attach it to a board and cover it with a peice of paper that is taped along one side so you can lift it up and see the finished work. Usually the client has their own ideas on framing and takes the pastel to be framed. Any competent frame shop knows how to frame a pastel. They may ask you if you want it sprayed with "fixative" which you should decline. I address the issue of fixative below in another article. The most common approach to framing is to use a "matt" to keep the glass off of the surface of the pastel. There are other ways to do this as well. Some of the world's most exquisite works of art are done in pastel. But it does have some limitations; Protective glass (or plastic) adds to the weight and size of the frame. Consequently, pastel it not suited to large works of art. There are as many styles and approaches to using pastel as there are artists. Sizes, prices and the quality of work vary greatly. I prefer to keep the pastel composition as simple as I can and leave some areas of the paper untouched. I try to make the pastel "look" like a pastel by using it in a way that shows off its unique properties and reserve the more complicated compositions for oil. Like many artists, I offer pastel portraits as a less expensive alternative to oil portraits. However, this is not necessarily true of all artists. Want to learn more about pastels? American Artist magazine collects its pastel-related articles and re-publishes them in a separate magazine called "Pastel Highlights". It is sold at the larger bookstores. A few pastel related links are listed below. Enjoy. Should you use Fixative on your Pastel? The short answer is NO. Please instruct your framer not to use fixative on the advice of the artist. Fixative may alter the colors and "values" (lightness and darkness) of the art. The pastel is already fixed to the "tooth" of the paper. The paper is designed for that. Before I deliver a pastel I hang the paper upright and "flick" it several times to dislodge any loose particles. Then I tape it to a sturdy board with a protective cover. I ask the client to use reasonable care in viewing and transporting the work. You must take care not to smear the pastel and it should be framed so that the glass does not touch the pastel. Do this and your pastel will be fine. Although the paper is flicked prior to framing, it is still possible that a few pastel particles may dislodge and fall down onto the edge of the mat after it has been framed. By not using fixative, you make a decision to preserve the original color and value of the pastel, exactly as it was created by the artist; You decide that the art is more important than the edge of a mat - and you are right. Do you mind if I tell you a story in order to make a point? A gallery Director once told me "I will never sell a pastel unless it has been fixed". She was not an artist and had not studied art or art history as many Directors have. She was a straight-up salesperson and she was good at it. So I tried to start a little debate. I said "by applying fixative you run the risk of altering the qualities that make a pastel look like a pastel. Apply too much fixative and you might darken the pastel and make it look more like an oil painting than a pastel. It is the absence of binders in the pastel that make the colors reflective and intense. By fixing the work you are adding binders and you run the risk of causing the pastel particles to meld together. Yes, a fixed work will not smear, but if it is properly framed no one is going to smear it anyway." The gallery Director just looked at me and then I continued: "The value of any work of art is based, at least in part, on the identity of the artist who made it - his style and intent. If the artist uses fixative as a tool in the making of a pastel, to create textured effects in the thickness of the work for example, that's cool. But after the artist finishes and delivers the pastel it is a mistake for you to change it in any way. Altering the pastel cannot add value and may possibly diminish its value." When I was done she just smiled and repeated herself, saying "I will never sell a pastel unless it has been fixed". She either lacked the knowledge or the desire to counter my arguments. I had failed to ensnare her, but that's OK because I knew what she was really saying: From her point of view, she does not want to risk having to explain all this to a customer who is about to pay top dollar for an upscale custom mat and frame. What if the customer forgets the whole educational speech, sees a bit of pastel on the mat and goes ballistic anyway? What if the customer demands that the mat be replaced or worse - what if he thinks his entire pastel is falling off? I can empathize with her. She's not paid to educate people about pastel or art in general. She wants to keep it simple and stay "on message". Yeah, I can empathize with her even though she was dead wrong. You see, to her customers she is more than a salesperson - she's a trustworthy source who is presumed to have a knowledge and a love of fine art that exceeds her role of a salesperson. If you accept this presumption and trust then you have to live up to it. In the end, dear art buyer, it is in your best interest to trust in what the artist made for you, follow his or her advice and enjoy the pastel as it was delivered to you.